SUICIDE BOMBINGS STRUCK churches in a major Indonesian city during services today, killing at least 11 people and wounding dozens in attacks which police said were carried out by a single family including two young girls. 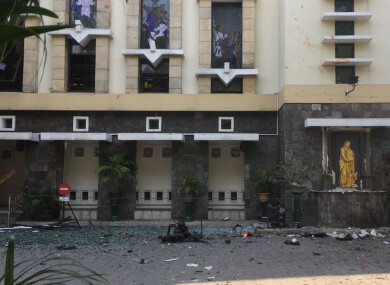 The bombings at three churches in Surabaya – claimed by the Islamic State group – were the deadliest in years, as the world’s biggest Muslim-majority country grapples with homegrown militancy and rising intolerance towards religious minorities. The bombers – a mother and father, two daughters aged nine and 12, and two sons aged 16 and 18 – were linked to local extremist network Jamaah Ansharut Daulah (JAD) which supports IS, said national police chief Tito Karnavian. East Java police spokesman Frans Barung Mangera confirmed the deaths of 11 people with 41 injured in the coordinated attacks at around 7.30 am (1.30am Irish time). In 2000, bombs disguised as Christmas gifts delivered to churches and clergymen killed 19 people on Christmas Eve and injured scores more across the country. Today’s bombings had the highest death toll since nine people were killed in 2009 attacks on two luxury hotels in Jakarta. But the coordinated nature of today’s bombings suggested a higher level of planning, analysts said. Email “Police say six members of same family responsible for suicide bombings in Indonesia”. Feedback on “Police say six members of same family responsible for suicide bombings in Indonesia”.